SmarterLifestyles.com Reviews - Legit or Scam? SmarterLifestyles.com Reviews – Legit or Scam? SmarterLifestyles.com is an advertorial based content site which offers articles on a wide variety of topics, intended to help those researching online or to offer solutions for everyday questions. 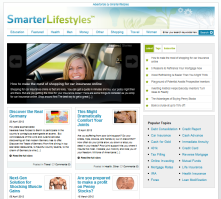 SmarterLifestyles.com provides articles on education, health, money, shopping, travel, men and women’s topics, and they provided a section on featured and miscellaneous articles as well. This website and all of its contents are free for visitors, and requires no membership or subscription. SmarterLifestyles.com is paid for by their partner companies, and not the people who read their articles. What is an Advertorial Website? An advertorial website is a website which presents advertisements in the form of editorial articles. These articles are generally intended to appear as objective or independently written articles, when in reality they are intended to promote a company or service. SmarterLifestyles.com openly admits to being an advertorial website, and even recommends that their visitors “fully research” any company they intend to business with before purchasing, investing, or subscribing. Some of the companies they promote are fairly easy to research, including those that have already been reviewed here at Reviewopedia.com. These include, but are not limited to: LendingTree.com, AwesomePennyStocks.com, Fisher Investments, and Davison. Just because SmarterLifestyles.com is a collection of advertisements and not really informative, objective articles does not necessarily mean it is a scam website. Some of the companies they are promoting may have questionable reputations, but that is why it is vitally important that you research all companies. However, being an advertorial website, SmarterLifestyles.com is compensated by the companies that they promote. And while they do get credit for openly admitting this, if you are trying to objectively research a topic, it is always a good idea to stay away from advertorial websites. Average Rating for " Smarter Lifestyles " is 1.4 out of 5 based on 10 reviews. Smarterlifestyles dot com is full of s**t and I encourage anyone to click on ads featuring their farticles so they have to pay big time. Lets get rid of them. DON'T click on anything on their site!! They have never had a legitimate partner. Research them? Why? They only do business with scammers. So, this is our fault. When you're reading a respectable site, we have to let them know that it's unacceptable to use adverts run by adblade, smarterlifestyles, etc., that are nothing but fabricated crap. That reflects on the legitimate site, if we hold their feet to the fire. A useless collection of advertisements. Every "article" is trying to sell a product, and usually a shady product at that. Even the information they provide is often false. I keep getting these disturbing ads that show up! Just plain disturbing! This website has advertised false information more than several times that I can count! Will be blocking their cookie soon, maybe file an incident report. Why do these bottom feeders think they can just plant a review and it's all OK? Not only is it always the only positive review, they always give themselves away saying something that no real person ever would. "News???" Yeah, like we don't know about advertorial sites... Or get godaddy.com to hide their registration and think that makes them anonymous. It's run by Ash Nashed, who cut his teeth on crap healthcare sites. Adblade hates their guts, so maybe they'll eliminate each other! Says the owner of the site. I find these adds useless. They are exaggerations and an insult. I have tried a couple of their products. They did not work for me. I keep getting unflattering photos of Obama and they are getting annoying now. I have even blocked their cookie... a lawsuit is next!